1883 Envelope from Brighton to Falkirk showing a very fine CALEDONIAN RAILWAY 'C R' IN BLACK, W635 no stops. 1911 Postcard from Arrochar to Carnwath showing a fine "CALEDONIAN STEAMER PACKET CO x LIMITED x /P. S./DUCHESS OF/HAMILTON cachet in Violet. 1806 Entire from John Dalrymple, Lt Col 22nd Foot, The Cheshire Rgt, to Haddington with, on the reverse, a very fine circular '.NORTH.BERWICK'. 1764 Entire addressed to Edinburgh with a very fine two-line DUN/DEE; on the front are hieroglyphics similar to "፼፼፼፼" which are SUPPOSED "STYLISED FEATHER = SPEED". 1892 Envelope from PEMBROKE COLLEGE, CAMBRIDGE to Edinburgh showing a fine EDINR&NEWCASTLE/SORTING TENDER cds, W 780. 1730 CARRIER'S ENTIRE FROM GLASGOW "TO INVERISREGAN" SENT "WITH 4 PARSAILS OF GOODS" and listing various items of clothing, etc. See enclosed transcript. 1814 Entire from Jamaica to Melrose showing on the front a superb framed "MISSENT/TO/HAWICK" in black. 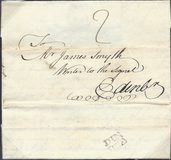 1759 Entire to Edinburgh showing on the reverse a superb straight line DUNDEE. 1915 Clynder (under Helensburgh) Parcel Post Label franked by a 3d, SG 375 tied by a very fine CLYNDER-DUMBARTONSHIRE circular datestamp. 1810 Entire from Liverpool to Leith and redirected to Edinburgh showing a very fine boxed MISSENT/TO/LEITH. 1843 EMBOSSED 2d DEEP BLUE POSTAL STATIONERY ENVELOPE addressed to Edinburgh and cancelled by two Hamilton Maltese Cross in black. VERY SCARCE USED WITH MALTESE CROSS. Two horizontal creases but still an attractive item. 1796 SOLDIERS ENTIRE FROM BANFF TO FORT GEORGE ENDORSED "LEIUT ALLAN CAMPBELL 2 BATTN 4 FENSBLS" PREPAID "P1" IN RED. Contents giving the "weekly state of Major Munro's Compy Banff Janr 14th 1796" and showing a superb straight-line BANFF. 1723 Cover to London showing a very fine small oval EDINBURGH BISHOP MARK FOR MA/16 IN RED. 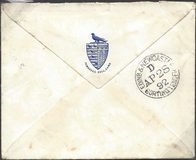 1840 Entire addressed to Charlestown, Dunfermlin cancelled by an EDINBURGH UNIFORM HANDSTRUCK '2' WITH DATE. SUPERB. 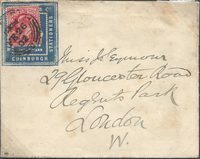 1856 Entire addressed to London and franked by a 1d Red-Brown, SG 29, tied by a very fine LEITH EXPERIMENTAL DUPLEX - Scarce. 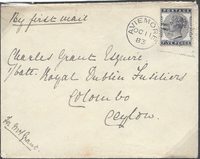 1858 Envelope cancelled by a LEITH/221 duplex and addressed to LERWICK, SHETLAND showing a very fine oval framed SHIP LETTER/LEITH, Robs S 7, in BLACK. There are Aberdeen and Lerwick circular datestamps on the reverse. 1856 1d Red-Brown, SG 29, tied to envelope to Paisley and cancelled by a fine Type VIII boxed GRASSMARKET SCOTTISH LOCAL CANCELLATION. 1887 9d Dull Purple & Blue, SG 209. An attractive used BLOCK OF NINE with superb ELLON (Abrdeenshire) circular datestamps. 1852 Envelope from Old Rain to Speymouth showing a VERY FINE BOXED MISSENT/TO/ABERDEEN. 1796 Entire to Banff showing on the reverse two very fine circular-framed two-line FOR/RES. 1838 FREE Front from London to Portpatrick showing a fine SCRIPT-TYPE 'Missentto/Dublin' in Red. 1853 1d Pink envelope from Edinburgh to Wishaw showing a FINE BOXED 'MISSENT/TO/DUNBLANE'. 1826 Entire from Cork to Bannockburn showing a fine BOXED "MISSENT/TO/GLASGOW" AND CORK 124 MILEAGE. 1861 Mourning envelope to Paisley franked by a 1d Rose-Red,SG 40,cancelled by a very fine TYPE 1 GREENOCK DOTTED CIRCLE DUPLEX, 30 CUTS - Unlisted, Code BL. Scarce. 1847 Cover from Cupar Fife to Edinburgh but missent showing a SUPERB 'MISSENT TO/LEVEN' IN BLUE. 1847 Unstamped cover to Holland cancelled by a KIRKCALDY '210' NUMERAL - UNUSUAL. 1827 Entire from Haddington to Morpeth showing a fine BOXED MISSENT TO/BERWICK. 1854 2d BLUE, SG 14, PLATE 4, G-K. A very fine four-margin example tied to cover from HAMILTON to GLASGOW. 1912 Postcard to Barnard Castle franked by a ½d Green, SG 340, tied by an Ardrossan cds showing alongside a fine "CALEDONIAN STEAM PACKET/DUCHESS/OF ROTHESAY" oval cachet in Violet. SCARCE.